Like any craft or discipline, practicing is a crucial part of playing music. 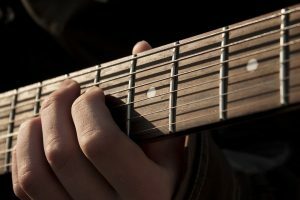 Not only does it improve your playing technique, but knowing various scales, chords, and techniques makes you a more creative and thoughtful musician. There are countless books for learning instruments and musical genres, but how useful are they for everyone? For example: if a seasoned player bought a practice book to keep up with everyday practice, they may find that it is too simplistic. More often than not, they cater to one very particular skill level, and this can be a problem with moving forward or revisiting fundamentals. For musicians of any and all skill levels, hosting lessons over video calling can be an enriching and rewarding learning experience. Many professional musicians—especially session musicians and “hired guns”—offer affordable lessons over the Internet. For instructors and students alike, FreeConference.com and its free video chat software is the perfect tool for hosting lessons across any distance. Playing an instrument is equal parts skill, dedication, and passion. Any given professional musician likely has years and years of experience under their belts. With so much time spent on stages, in studios, and giving private lessons, the best players have played in all kinds of settings and genres. Thankfully for other musicians, many of these players offer lessons over the Internet. The biggest benefit of lessons using a video chat software is the real-time aspect—instructors can offer valuable playing advice to their students face-to-face in an online chat room, and they can also observe their technique. Technique is one of the most important parts of learning, as proper technique can prevent any muscle injuries (especially in violins and saxophones), so it is important for students to play properly. After all, if you keep repeating your mistakes, how can you possibly progress? Real-time instruction can also give the instructor a better feel for the student’s overall skill level, and plan lessons around it. To even better monitor progress, instructors can schedule regular meetings to ensure that the student’s playing is improving. With FreeConference.com’s screen sharing feature, instructors can easily share chord shapes, sheet music, and technical diagrams. This is especially good for musicians learning jazz and classical music—these genres can feature very difficult chords and melodies, and it helps to visualize them when practicing. With the ability to see each other’s screens, you can also save valuable lesson time by avoiding downloads and opening apps, all while keeping your crystal-clear video call going. Music has the power to enrich our spirits, bring communities together, and give value to our lives. It is never too early or too late to start, and it is always important to practice efficiently and consistently, no matter what your skill level. On FreeConference.com, picking up an instrument to learn has never been easier! Music teachers: use video calling to share your knowledge with the world (and make some side money while you’re at it).